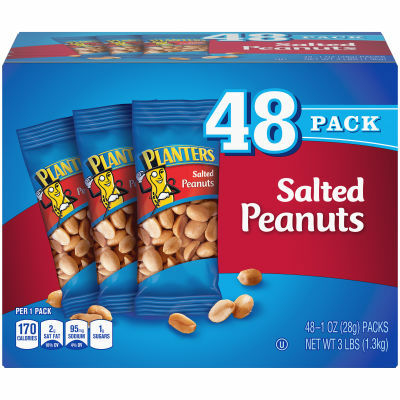 A Planters original, these salted peanuts are seasoned with pure sea salt and are good source of , fiber, and vitamin E. Each peanut is carefully skinned and peeled and then finely seasoned with sea salt to enhance the natural nut flavor. - Available in a convenient 48-pack of 1 oz. snack-size bags so you can stock up on this savory and nutritious treat. Serving size 1 pack (28g).